The new Peugeot 406 SuperSport from Spirit. A surprise showed up today... I got a pair of the new cars. I've had a few laps on my small wood track here at home and I'd say this car is an improvement over an already nicely done car (the standard and kit/sport) Peugeot 406 Silhouette. Right off the top one surprising thing was that this car comes on a clear set up block. I know it's maybe not an earth-shattering idea, but I do think that it's really a very nice touch that Spirit has included one in this kit. 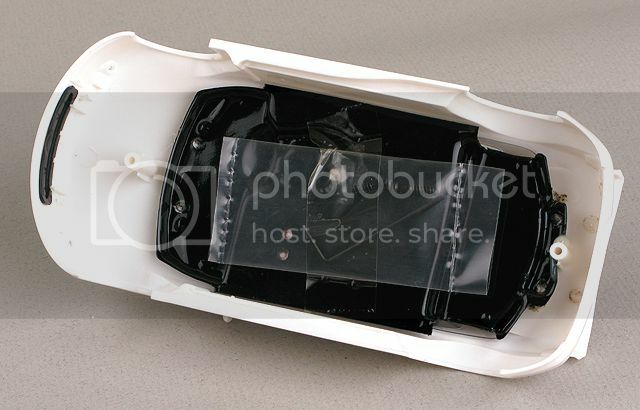 The car now has a vacuum formed interior and glass piece. 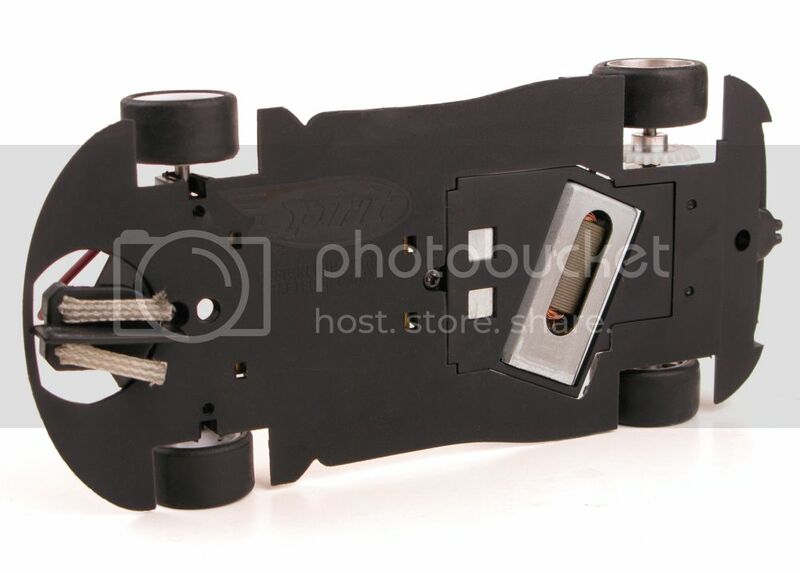 Delrin front wheels and magnesium rear wheels, both with M2 set screws. The front axle is hollow. 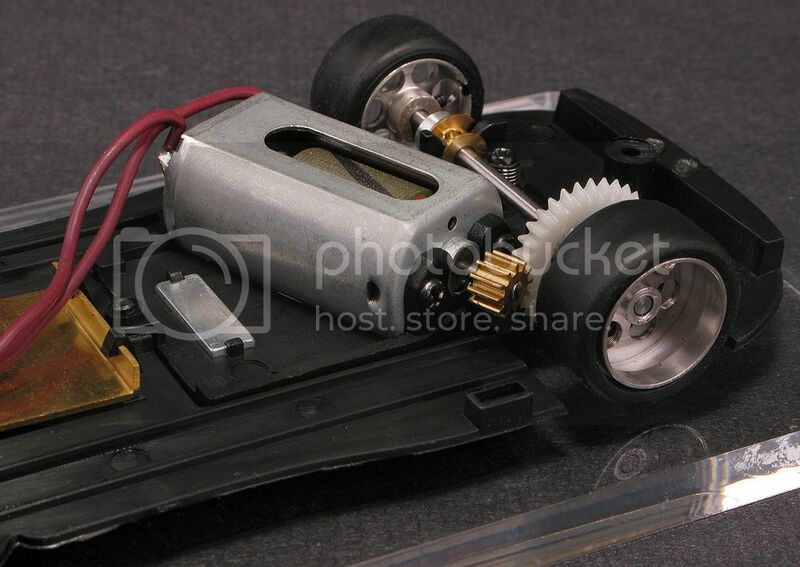 The chassis is new and appears to have just a bit more space around the motor pod than the previous models did. Also the pod feels like it floats better in the chassis (because of improved fit on the rear screws maybe?). Inside you'll find the body screws and an M2 driver. Beefier, silicone-wrapped wires on this model (much softer wires than previous Peugeots). And a small 5.5 gram brass weight is snapped into the chassis. The SxXx 25,400 (@ 14 volts rated) with 250 gcm. 12 tooth pinion, 32z crown that's a set screw/aluminum hub crown. The motor pod is braced better between the motor/axle bearing holder now and the motor is screwed into place. As you might just be able to see the bearings have a hole in them for lubrication now too. And the set screw on the crown gear is visible in this photo as well. The car looks great! 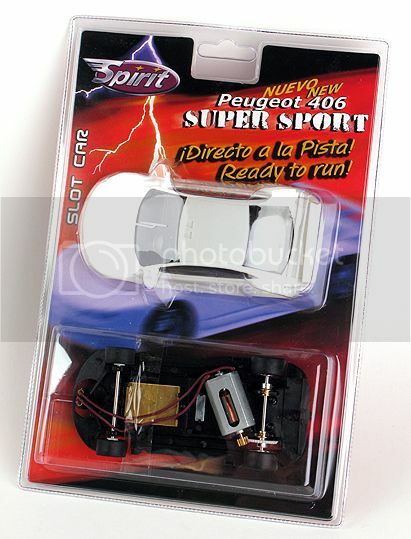 I would like to see Spirit either re-release the Peugeot 406 Silhouette liveries on the new chassis (perhaps a limited edition of each car) or offer the chassis separately to upgrade the older cars. Spirit continues to amaze me both in how bad the parts can be but also what a great platform for a fantastic race car they make. I am looking forward to these showing up in the display case at the raceway. Dave, are these cars available now? Not yet. Have you driven a standard Peugeot yet Mark? Yes. They're great runners on NINCO mainly because of the motor position - anglewinder & very low motor heigh. Pod is a little too soft, but it seems it's been taken cared of in this new release. Sweet! I like the Pugs a lot. Do know when they will be on sale and what the price will be? I don't know when it will be for sale or the price yet. I will be looking forward to this as well. I have a previously released sport version silhouette and 406 coupe. This looks the same basic package with delrin front wheels instead of alloys. 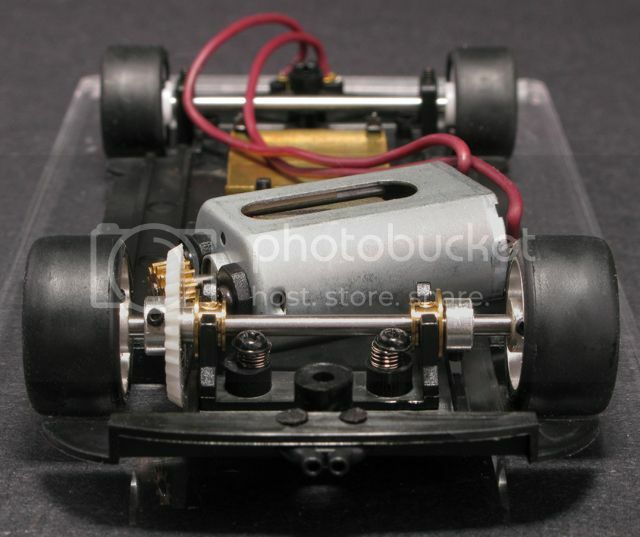 Also has the brass plate thingy which is not where i would place weight but might make the car more stable. Interestingly the motor has a balanced com unlike previous versions. I have found the pod on the older versions was far too soft for such a powerful motor and needed some serious bracing to run well on wood. Visually at least this pod seems the same but spirit did make some noise a while back about releasing a stiffer pod so will be interesting to see if this has come to fruition. The 406 series are truly great runners with a tweak or two and hopefully this version is aprreciated. Previous versions do have a balanced comm, you must not have gotten one that was. The weight is where the digital chip clips are for the SCX-Digital chip that's why the weight is in that spot. The pod is different if you note the screws that hold the motor in place (the bracing between the motor mount and axle holder isn't evident from these photos. The pod is also a glass-filled plastic like a typical Slot It pod, it's quite a rigid pod now. Slightly OT, is there any news of the 936 LT coming out as a sport version? Seem to recall it raised as next 936 to be released a while back. I'm not sure about the 936 Sport version. I'll have to ask about it. Cheers for that Dave. Good to hear about the pod. I noted the gear is also a set screw one and not fixed as in the previous versions which is a nice touch. Any news on what the diameter of the axles are on these? I have a few of the 406 series 2 silhouettes and 2 406 sedans and they run very well. Very competitive in their respective classes. I got 2 sport versions with sxxx motors and 2 standard versions with s3x motors and i can't remember any of them having a balanced com but maybe i just didn't look. 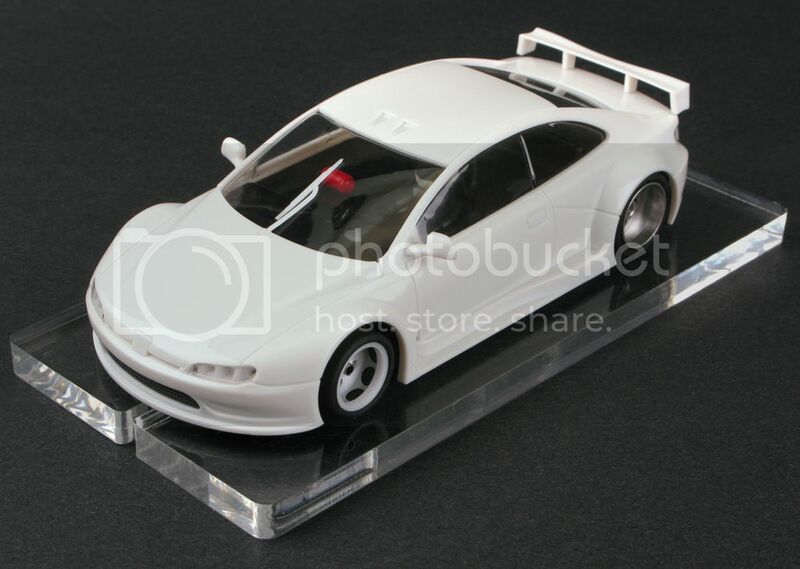 These cars are great runners and have a fantastic body/chassis fit. The standard adjustable front end is great for wood runners allowing you to set the front end perfectly and as stiff as you like. 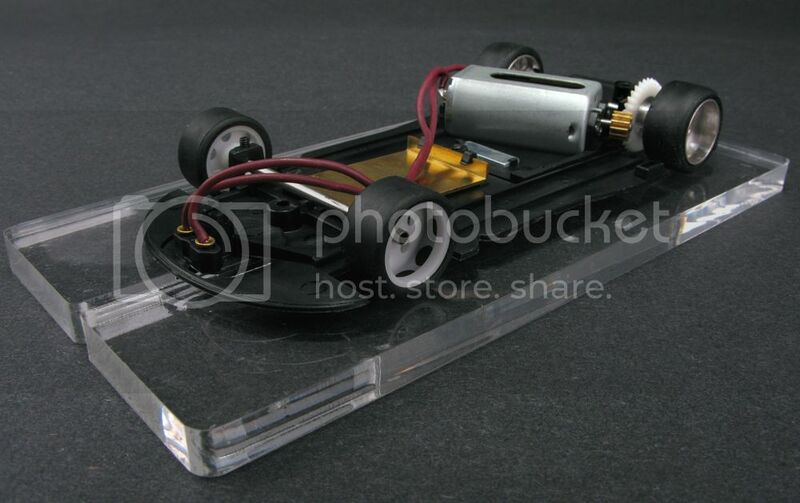 Can anyone tell me if the 406 coupe body will fit on this chassis?